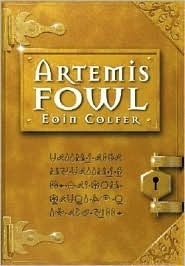 Artemis Fowl is the first novel in the Artemis Fowl Octet written by the Irish author Eoin Colfer. It is a fantasy novel series with the concept that fairies do exist, but the human perception about them is awfully incorrect. The story begins in Ho Chi Minh City in Vietnam where the twelve year old criminal master-mind, Artemis and his Eurasian bodyguard, Butler are in search of someone, a fairy. The wealth of the Fowls is going bankrupt and Artemis is desperate to recover their fortune and sees an opportunity in his discovery of a whole new race – the fairies that live underground. Artemis Fowl, after diligent research on the history, traditions, customs, language and rules of the fairies, finally, kidnap an elf for ransom, going by the name Holly Short, who is a captain in the Lower Elements Police. But neither of them know that these fairies aren’t the kind ones portrayed in stories written by humans (mud people, in the fairies’ vernacular) and are a way too advanced, as far as their technology is concerned. For the first time in his life, Artemis is having challengers who are capable of providing him a real challenge. The author saw the whole concept of fairies differently and very often, you don’t need an altogether different concept to tell a good story, but you just have to present the same thing in an innovative way and that is precisely what Colfer has done. All along, fairies are simple creatures, kind, meek and they’re usually least bothered about keeping themselves happy. But these fairies are different – they’re organised, they have advanced technology and also happen to be peace loving but that doesn’t mean that they won’t defend themselves at a time of crisis. The second highlight about this book was Artemis’ character. He’d have otherwise been termed a brat for his haughty and arrogant nature had it not been for his brilliance and I loved his rhetoric, in particular. The character building was also good, providing a good foundation for the subsequent novels. What I disliked, in particular was the author’s tirade on humans – especially, considering the circumstances of this novel, the fairies aren’t any different. Yes, the humans, right now, are struggling to maintain peace within their own race but at the same time, even among the fairies, each race hates at least one of the other races, for instance, the dwarves and the goblins don’t go well with each other. Humans are blamed for their greed but the fairies too, are often affected by jealousy and many are power hungry and so, I don’t see a reason why the author had to point out as though they were only exclusive to humans when the race he has created isn’t any different. Moreover, I found certain points logically inconsistent, where the fairies were supposedly at a disadvantage against humans due to their sheer numbers mainly because fairies were born to a mother only once every twenty years and considering their life span which runs into several centuries, the time lag is rather insignificant. Besides that, there is nothing more to say without giving anything away and I don’t intend to be accused of spoiling a reader’s fun. For a change, I actually appreciated the element of humour in a novel, probably because it wasn’t standard slapstick humour. Considering the idea, which is really crucial in a fantasy novel, the cat and mouse game between Artemis and the fairies and the narration, I’d give this an eight on ten.